If I use a file name (i.e. 'autoruns.exe') as a thought name, the file name extension ('.exe') is suppressed. I rather would like to see the file extensions. What do I have to change? 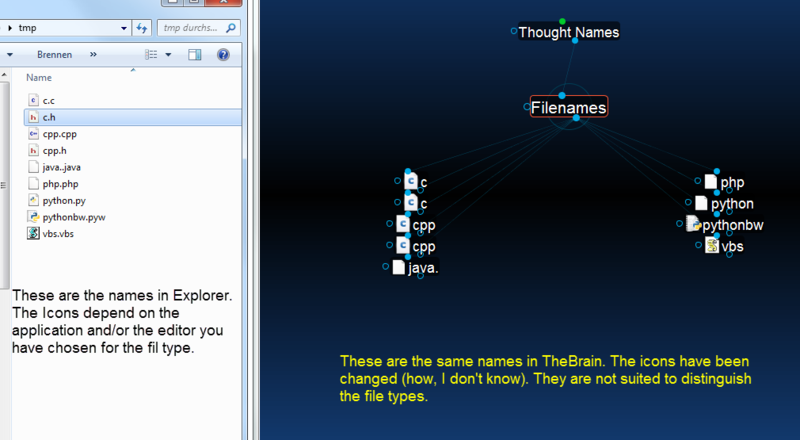 I've tested this with multiple "file extension" names, including your example, and have found no issue naming Thoughts. Anything I may be missing during testing? I think he's referring to .exe files, .doc files etc being dragged in and the extension then not being visible in the thought name. It's a fair request, but I for one wouldn't like this feature, so if it was implemented it should be optioned in preferences. Yes, Spacenexus is right; it happens when dragging filenames into the plex. And yes, it would be best to make this a preference (similar to the one in Windows Explorer). Recall also that the icons already automatically reflect file type so that image so that does already help. I will see if this is something that can be implemented. A temporary workaround, in the meantime, is to simply rename the Thought to include the extension after the file has been added.